I’ve been researching and working in the area of modern microservices for the past ~3 to 4 years and have always seen a strong relationship between Modern Microservices with tools and cultures like Docker and DevOps back to Service-Oriented Architecture (SOA) and design. I traced SOA roots back to Gartner Research in 1996  or at least this is what I could find, feel free to correct me here if I haven’t pegged this. More importantly for this post I will briefly explore SOA concepts and design and how they relate to Modern Microservices. Microservice Architectures (MSA) (credit to meetups and conversations with folks at meetups), are typically RESTful and based on HTTP/JSON. MSA is an architectural style not a “thing” to conform exactly to. In other words, I view it as more of a guideline. MSAs are derived from multiple code bases and each microservice (MS) has or can have its own language it’s written in. Because of this, MSAs typically have better readability and simpler deployments for each MS deployed which in turn leads to better release cycles as long as the organization surrounding the MS teams is put together effectively (more on that later). An MSA doesn’t NEED to be a polyglot of but will often naturally become one because teams may be more familiar with one language over the other which helps delivery time especially if the interfaces between microservices are defined correctly, it truly doesn’t matter most of the time. It also enables scale at a finer level instead of worrying about the whole monolith which is more agile. Scaling a 100 lines of Golang that does one thing well can be achieved much easier when you dont have to worry about other parts of your application that dont need or you dont want to scale in the monolith. In most modern MSAs, the REST interfaces mentioned earlier can be considered the “contract” between microservices in an MSA. These contracts should self describing as they can be, meaning using formats like JSON which is human readable and well-organized. Overall an MSA doesn’t just have technical benefits but could also mean fewer reviews and approvals because of smaller context boundaries for each microservice team. Better acquisition and on-boarding because you dont have to be so strict about language preference, instead of retooling, you can ingest using polyglot. Motivations for SOA, from what I have learned, is typically business transformation oriented which shouldn’t be surprising. The enterprise based SOA transformation on a large budget but the motivation is different now with modern MSA, now its quick ROI and better technology to help scale using DevOps practices and platforms. Circuit Breaker Pattern, a control point between microservices. Bulkhead, do not allow 1 problem affect the entire boat, each microservice has its own data service / database / connection pool, 1 service does not take down the whole system or other microservices. You can do microservices with or without service discovery / catalog. Does it over complicate things? The referenced text that I use for a comparison or similar concepts and differences in this post talk about a vast number of important topics related to Service-Oriented Architecture. Such topics include the overall challenges of SOA, service reuse, deployment efficiency, integration of application and data, agility, flexibility, alignment, reference architectures, common semantics, semantic pitfalls, legacy application integration, governance, security, service discovery, inventory and registration, best practices and more. This post does not go into depth of each individual part but instead this post aims at looking at some of the similarities and differences of SOA and modern microservices. SOAs typically had a Service Bus or ESB (Enterprise Service Bus) a complex middleware aimed at providing access and masking of interfaces. Technologies widely used are JSON, REST/HTTP and Polyglot services. Communication is done over HTTP and the interfaces are abstracted using RESTful contracts. Value chain and business model is about efficiencies, small teams and DevOps practices while eliminating cilos. I want to spend a little bit of time on one of the analogies that stuck with me about modern microservices. This was the Bulkhead analogy which I cannot for the life of me remember where I heard it or seem to google a successful author so credit to who or whom ever you are. The bulkhead analogy is pretty simple actually but has a powerful statement for microservice design. The analogy is such that a MSA, like a large ship is made up of many containers (or in the ships case, bulkheads) that have boundaries between them and hold different component of the ships such as engines, cargo, pumps etc. In MSA, these containers hold different functions or processes that do something wether its handle auth requests, connection to a DB, service a lookup or transformation mechanism it doesn’t matter, just that in both cases you want all containers to be un-damaged for everything to be running the best it can. The bulkhead analogy goes further to say that if a container gets damaged and takes on water then the entire ship should not sink due to one or few failures. In MSA this can be applied by saying that a few broken microservices should not be designed in a way where there failure would take down your entire application or business process. It essence designs the bulkheads or containers to take damage and remain afloat or “running”. Again, this analogy is quite simple, but when designing your MSA it’s important to think about these details and is why doing things like proper RESTful design and Chaos testing is worth your time in the long run. Given the little glimpse of information I’ve provided above about service oriented architectures and microservices architectures I want to spend a little time talking about the obvious similarities and differences. Focus on business process, instead of the focus of many services making one important business process MSA focuses on allowing one thing (containerized process) to do one thing and do it well. This allows tighter context boundaries for microservices. SOA tailors towards SOAP, XML, WSDL while MSA favors JSON, REST and Polyglot. This is one of the major differences to me, even though its just a tech difference this RESTful polyglot paradigm enables MSAs to thrive with todays developers. The value chain and business model is more DevOps centric allowing the focus to be on loosely coupled teams that break down cilos and can focus on faster release cycles and CI/CD of their services rather than with SOA teams typically still had one monolithic view of the ESB and services without the DevOps focus. Overall this post was mainly a complete high-level overview of what I think are some of the concepts and major differences between traditional SOA and Modern Microservices that stemmed from a course I took during my masters that explored SOA while I was in the industry working on Microservices. The main point I would say I have is that SOA and MSA are very similar but MSA being SOA’s offspring in a way using modern tooling and architecture approaches to todays scaleable data center. Note* by no means did I cover SOA or MSA to do them any real justice, so I suggest looking into some of the topics talked about here or reading through some of the references below if your interested. This entry was posted in cloud, containers, Data Center, development, devops, docker, microservices, public cloud on December 22, 2016 by wallnerryan. Private/Public IaaS, and PaaS environments are some of the fastest moving technology domains of their kind right now. I give credit to the speed of change and adoption to the communities that surround them, open-source or within the enterprise. As someone who is in the enterprise but contributes to open-source, it is surprising to many to find out that within the enterprise there is a whole separate community around these technologies that is thriving. That being said, I have been working with os-level virtualization technologies now for the past (almost) 3 years and in the past 2 years most people are familiar with the “Docker-boom” and now with the resurgence or SoA/Microservices I think its worth while exploring what modern technologies are involved, what drivers for change and how it affects applications and your business alike. Containers and Microservices are compelling technologies and architectures, however, exposing the benefits and understanding where they come from is a harder subject to catch onto. Deciding to create a microservice architecture for your business application or understanding which contexts are bound to which functionality can seems like the complexity isn’t worth it in the long wrong. So here I explore some of the knowledge of microservices that is already out there in understanding when and why to turn to microservices and figuring out why, as in many cases, there really isn’t a need to. In this post I will hopefully talk about some of major drivers and topics of microservices and how I see them in relationship to data-center technologies and applications. These are my own words and solely my opinion, however I hope this post can help those to understand this space a little better. I will talk briefly about, Conway’s Law, what it means to Break Down the Silos, why it is important to Continuous delivery, the importance of the unix philosophy, how to define a microservice, their relationship to SOA, the complexity involved in the architecture, what changes in the organization must happen, what companies and products are involved int this space, how to write a microservice, the importance of APIs and service discovery, and layers of persistence. The best definition in my opinion is “A Microservice fits in your head”. There are other definitions involving an amount of pizza, or a specific amount for lines of code, but I don’t like putting these boundaries on what a microservices is. In the simplest, a microservice is something that is small enough to conceptually fit in your head without really having to think to much about it. You can argue about how much someone can fit in their head etc, but then thats just rubbish and un-important to me. 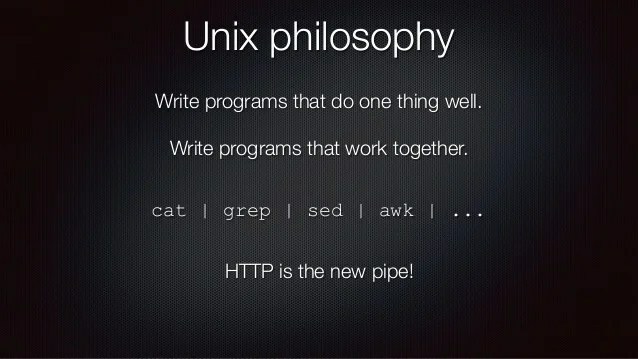 I like to bring up the unix principle here as ice heard from folks at Joyent and other inn he field, this is the design that programs are designed to do one thing and do that one thing well. Like “ls” or “cat” for instance, typically if you design a microservice this way, you can limit its internal failure domain because it does one thing and exposes and API to do so. Now, microservices is a loaded term, and just like SoA there are similarities in these two architectures. But they are just that, architectures and I will add that you can find similarities in many of their parts but the some of the main differences is that SoA used XML, SOAP, typically a Single Message Bus for communication and a shared data source for services. Microservices uses more modern lightweight protocols like RESTful APIs, JSON, HTTP, RPC and typically a single microservice is attached to its own data source, whether is a copy, shard or a its own distributed database. This helps with multi-tenancy, flexibility and context boundaries that help scale such an architecture like microservices. One of the first things people start to realize when deep divining into microservices is the amount of complexity that comes out of slicing up the monolith because inherently you need to orchestrate, monitor, audit, and log many more processes, containers, services etc than you did with a typical monolithic application. The fact that these architectures are much more “elastic and ephemeral” than others forces technical changes that center around the smallest unit of business logic that helps deliver business value when combine with other services to deliver the end goal. This way each smaller unit can have its own change lifecycle, scale independently and be developed free of other dependencies within the typical monolith. 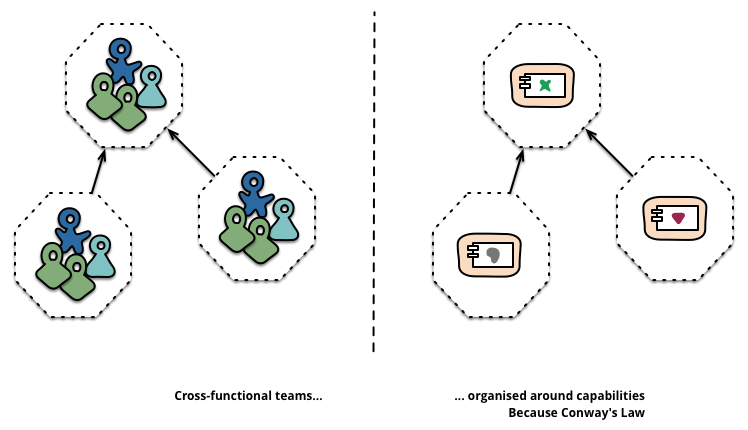 This drives the necessity to adopt a DevOps culture and change organizationally as each service should be developed by independent, smaller teams that can each release code within their own cycles. Teams still need to adhere to the invisible contracts that are between the services, these contracts are the APIs themselves between the services which talk to one another. 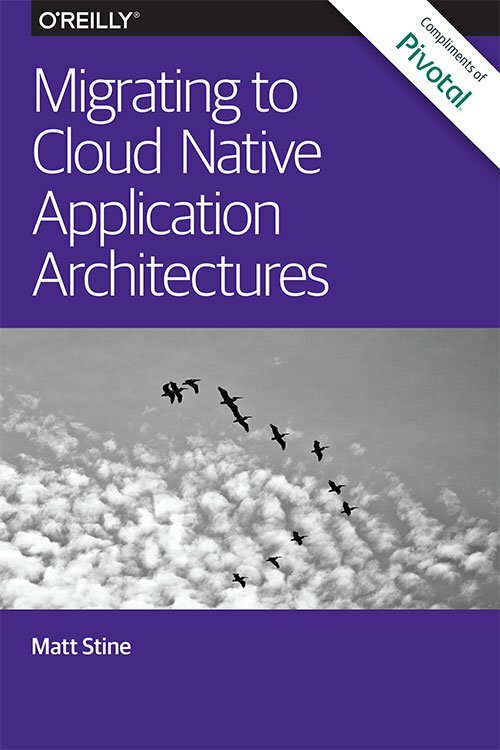 I could spend an entire post on this topic but there is a great book called “Migrating to Cloud-Native Application Architectures” by Matt Stine of Pivotal (Which is free, download here) that talks about organizational changes, api-based collaboration, microservices and more. 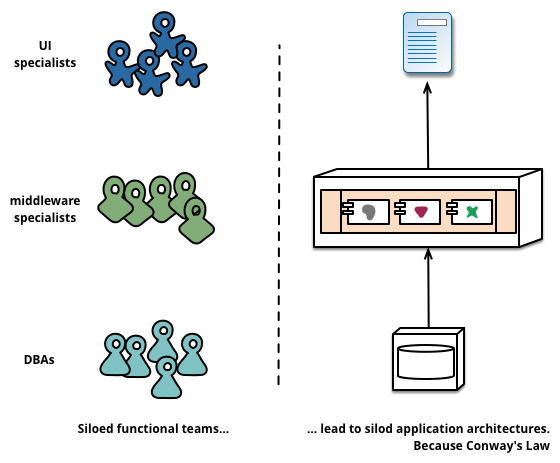 There is also a great post by Martin Fowler (here) that talks about microservices and the way Conways law affects the organization. I want to briefly talk about the importance of orchestration, choreography and the important of the APIs that exist within a microservices architecture. A small note on choreography, this is another terms that may be new but its related to orchestration. Choreography is orchestration turned on its head, instead of an orchestration unit signaling when things happen, the intelligence is pushed to the endpoints and those endpoints react to events of changing environments, therefore each service known its own job. A great comparison of this is (here) in the book “Building Microservices” by Sam Newman. Rest APIs are at the heart of this communication, if an event is received from a customer of user, a choreography chain is then initialized and each endpoint talks to each other via these APIs, therefore, these APIs must remain robust, backward compatible and act as contracts between how services interact. 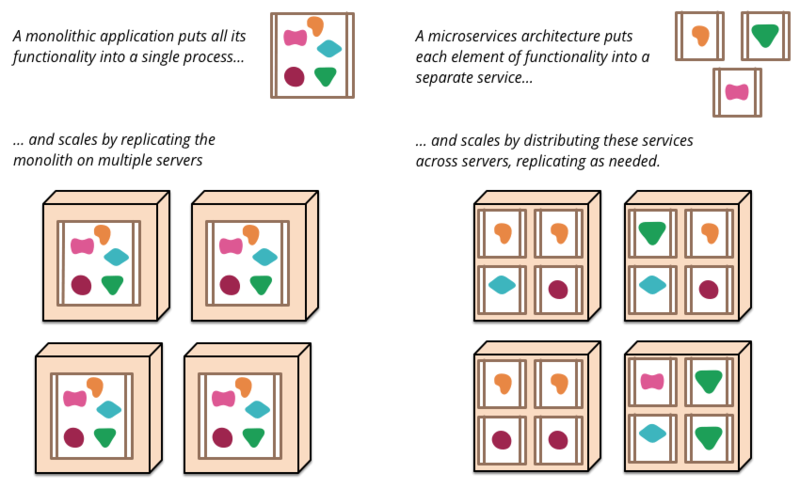 A great post of the Netflix microservices work (here) explains this in a little more detail. If the last few paragraphs and resources make some sense, you end up with a combination of loosely coupled services, strict boundaries, APIs (contracts), robust choreography and vital health and monitoring for all services deployed. These services can be scaled, monitored and moved independently without risk and react well to failures. Some of the exa plea of tools to hel you do this can be found at http://netflix.github.io. This all sounds great, but without taking the approach of “design for the integrations not the infrastructure/platform” (which I’ve heard a lot but can’t quite figure out who the quote belongs to, coudos to who you are :] ) this can fail pretty easily. There is a lot of detail I didnt cover in the above and I suggest looking into the sources I listed for a start on getting into the details of each part. For now I am going to turn to a few topics within microservices, Service Discovery & Registration and Data Persistence layers in the stack. when a service gets installed or “comes up” it needs to initially be registered with the discovery layer. An example of this is Registrator (https://github.com/gliderlabs/registrator) which reacts to docker containers starting and sends key/value pairs of data to a tool like Consul or Etcd to keep current discovery data about the service. Such information could be IP Endpoint, Port, API URL/Path, Resources, etc that can be used by the service. Discovery is the other end of Registration, when a service wants to use a (for instance) “proxy”, how will it know where the proxy lives or how to access it? Typically in applications this information is in a configuration file or hard coded into the app, whith service discovery all the app needs to do is know how to implement the information owned by the registration mechanism. For instance, an app can start and immediately say “Where is ‘Proxy'” and the discovery mechanism can respond by saying “Here is the Proxy thats closest to you” or “Here is the first Proxy available” along with the IP and Port of that proxy, the app can then just use those values, typically given in JSON or XML and use them inside the application thus not ever hardcoding any configuration anywhere. Last but smallest is when the applications received the response back from the discovery mechanism it must know how to process and the the data. E.g. if your asking for a proxy or asking for a database the information given back would be different for the proxy versus how you would actually access the database. I also wanted to mention an interesting note on persistence in the way Netflix deploys Cassandra. All the data that Netflix uses is deployed on Amazon on EC2 instance and they use ephemeral storage! Which means when the node dies all their data is gone. But alas! they don’t worry about this type of issue anymore because Cassandra’s distributed, self healing architecture allows Netflix to move around their persistence layers and automatically scale them out when needed. I found out they do run incremental backups to S3 by briefly speaking with Adrian Cockcroft at offices hours at the Oreilly Software Architecture conference. I found this to be a pretty interesting point to how Netflix runs its operations for its data layers with Cassandra showing that these cloud-native, flexible, and de-coupled applications are actually working in production and remain reliable and resilient. There are many other open source tools at work like Docker Swarm, Consul, Registrator, Powerstrip, Socketplane.io (Now owned by Docker Inc), Docker Compose, Fleet, Weave. Flocker and many more. This is just a token to how this field of technology is booming and were going to see many fast changes in the near future. Its clear that future importance of deploying a service and not caring about the “right layers” or infrastructure will be key. Enabling data flexibility without tight couplings to the service is part of an the overall application design or the data service. These architectures can be powerful for your applications and for your data itself. Ecosystems and communities alike are clearly coming together to help and try to solve problems for these architectures, I’m sure some things are coming so keep posted. One way to get some experience with these tools is to run some examples on your laptop, checkout Lattice (https://github.com/cloudfoundry-incubator/lattice/) from Cloud Foundry which allows you to run some microservice-like containerized workloads. This post is more about the high-level thinking, and I hope to have some more technical posts about some of the technologies like Lattice, Swarm, Registrator and others in the future. This entry was posted in cloud, containers, Data Center, devops, docker and tagged automation, cloudfoundry, continuous integration, docker, microservices on April 10, 2015 by wallnerryan. Over the past few months one of the areas worth exploring within the container ecosystem is how it works with external services and applications. I currently work in EMC CTO Advanced Development so naturally my interest level is more about data services, but because my background working with SDN controllers and architectures is still one of my highest interests I figured I would get to know what Powerstrip was by working with Socketplane’s Tech Release. This is not the official integration for powerstrip with sockeplane merged over the last week or so, I was working on this in a rat hole and it works a little differently than the one that Socketplane merged recently. Powerstrip is a simple proxy for docker requests and responses to and from the docker client/daemon that allows you to plugin “adapters” that can ingest a docker request, perform an action, modification, service setup etc, and output a response that is then returned to Docker. There is a good explaination on ClusterHQ’s Github page for the project. Powerstrip is really a prototype tool for Docker Plugins, and a more formal discussion , issues, and hopefully future implementation of Docker Plugins will come out of such efforts and streamline the development of new plugins and services for the container ecosystem. Using a plugin or adapter architecture, one could imagine plugging storage services, networking services, metadata services, and much more. This is exactly what is happening, Weave, Flocker both had adapters, as well as Socketplane support recently. I decided to explore using Golang, because at the time I did not see an implementation of the PowerStripProtocol in Go. What is the PowerStripProtocol? The Powerstrip protocol is a JSON schema that Powerstrip understands so that it can hook in it’s adapters with Docker. There are a few basic objects within the schema that Powerstrip needs to understand and it varies slightly for PreHook and PostHook requests and responses. The below scheme is what PowerStripProtocolVersion: 1 implements, and it needs to have the pre-hook Type as well as a ClientRequest. The below scheme is what PowerStripProtocolVersion: 1 implements, and it needs to have the post-hook Type as well as a ClientRequest and a Server Response. We add ServerResponse here because post hooks are already processed by Docker, therefore they already have a response. What this looks like in Golang is the below. (I’ll try and have this open-source soon, but it’s pretty basic :] ). Notice we implement the main PowerStripProtocol in a Go struct, but the JSON tag and options likes contain an omitempty for certain fields, particularly the ServerResponse. This is because we always get a ClientRequest in pre or post hooks but now a ServerResponse. Powerstrip suggests that adapters be created as Docker containers themselves, so the first step was to create a Dockerfile that built an environment that could run the Go adapter. First, we need a Go environment inside the container, this can be set up like the following. We also need a couple of packages so we include the “go get” lines for these. Our Go-based socketplane adapter is laid out like the below. (Mind the certs directory, this was something extra to get it working with a firewall). “actions” contains the Start and Create actions that process the two pre hook and post hook calls mentioned above. The create hook does most of the work, and I’ll explain a little further down in the post. Now we can run “docker buid -t powerstrip-socketplane .” in this directory to build the image. Then we use this image to start the adapter like below. Keep in mind the script is actually using the “unattended nopowerstrip” options for socketplane, since were using our own separate one here. Once it is up an running, we can use a simple ping REST URL to test if its up: It should respond “pong” if everything is running. Now we need to create our YAML file for PowerStrip and start our Powerstrip container. The adapter will automatically spawn off a socketplane/socketplane:latest container because it installs socketplane brings up the socketplane software. Once this is up, we need to update our DOCKER_HOST environment variable and then we are ready to go to start issuing commands to docker and our adapter will catch the requests. Few examples below. Next we create some containers with a SOCKETPLANE_CIDR env vairable, the adapter will automatically catch this and process the networking information for you. docker create --name powerstrip-test1 -e SOCKETPLANE_CIDR="10.0.6.1/24" ubuntu /bin/sh -c "while true; do echo hello world; sleep 1; done"
If you issue an ifconfig on either one of these containers, you will see that it owns an ovs<uuid> port that connects it to the virtual network. PING 10.0.6.2 (10.0.6.2) 56(84) bytes of data. So what’s really going on under the covers? PreHookContainersCreate checks the client request Body foe the ENV variable SOCKETPLANE_CIDR, if it doesn’t have it it returns like a normal docker request. If it does then it will probe socketplane to see if the network exists or not, if it doesn’t it creates it. In either case, there will be a “network-only-container” created connected to the OVS VXLAN L2 domain, it will then modify the response body in the ModifiedClientRequest so that the NetworkMode gets changed to –net:container:<new-network-only-container>. Then upon start the network is up and the container boots likes normal with the correct network namespace connected to the socketplane network. Here is a brief architecture to how it works. Thanks for reading, please comment or email me with any questions. This entry was posted in cloud, containers, Data Center, development, docker, EMC, innovation, networking, SDN and tagged cloud, containers, datacenter, docker, EMC on February 11, 2015 by wallnerryan. Containers have no doubt been a hyped technology in 2014 and now moving into 2015. Containers have been around for a while now (See my other post on a high-level overview of the timeline) and will be a major technology to think about for the developer as well as within the datacenter moving forward. Today I want to take the time to go over Socketplane.io’s first preview of the technology they have been working on and since announcing their company in mid-october. Socketplane.io is “driving DevOps Defined Networking by enabling distributed security, application services and orchestration for Docker and Linux containers.” and is backed by some great tech talent, Brent Salisbury, Dave Tucker, Madhu Venugopal, John M. Willis who all bring leading edge network and ops skills into one great effort which is socketplane.io. I have had the pleasure to meet up with Brent and Madhu at ONS last year and have done some work with Brent way back when I was working on Floodlight, and am very excited for the future of Socketplane.io. What’s behind Socketplane.io and What is the current preview technology? First lets look at the components of what we will be setting up in this post. Below you will see 2 nodes: socketplane node1 and socketplane node2, we will be setting up these using Vagrant and Virtualbox using Socketplane’s included Vagrantfile. In these two nodes, when socketplane starts up we it will install OVS and Docker and start a socketplane container that runs Consul for managing network state. (one socketplane container will be the master, I’ll show more on this later as well). Then we can create networks, create containers and play with some applications. I will cover this in detail as well as show how the hosts are connected via VXLAN and demo a sample web application across hosts. Set an environment variable named SOCKETPLANE_NODES that tells the installation file how many nodes to setup on your local environment. I chose 3. Then run “vagrant up” in the source directory. Now we can SSH into one of our socketplane nodes. Lets SSH into node1. Now you SSHed into one of the socketplane nodes. We can issues a “sudo socketplane” command and see the available options the CLI tool gives us. This will create a vnet named foo4 along with a vlan for vxlan and default gateway at the .1 address. Now we can see both our default network and our “foo4” network in the list command. If we look at our Open vSwitch configuration now using the “ovs-vsctl show” command we will also see a new port named foo4 that acts as our gateway so we can talk to the rest of the nodes on this virtual network. You should also see the vxlan endpoints that aligns with your eth1 interfaces on the sockeplane node. Great, now we are all set up so run some containers that connect over the virtual network we just created. So on socketplane-1 issue a “sudo socketplane run -n foo4 -it ubuntu:14.10 /bin/bash”, this will start a ubuntu container on socketplane-1 and connect it to the foo4 network. You can Ctrl-Q + Ctrl-P to exit the container and leave the tty open. If you issue a ovs-vsctl show command again you will see a ovs<uuid> port added to the docker0-ovs bridge. This connects the container to the bridge allowing it to communicate over the vnet. Lets create another container, but this time on our socketplane-2 host. So exit out and ssh into socketplane-2 and issue the same command. We should then be able to ping between our two containers on different hosts using ths same vnet. Awsome, we can ping out first container from our second without having to setup any network information on the second host. This is because the network state it propagated across the cluster so when we reference “foo4” on any of the nodes it will use the same network information. If you Ctrl-Q + Ctrl-P while running ping, we can also see the flows that are in our switch. We just need to use appctl and reference our docker0-ovs integration bridge. As we can see our flows indicate the VXLAN flows thatheader and forward it to the destination vxlan endpoint and pop (action:pop_vlan) the vlan off the encap in ingress to our containers. To show a more useful example we can start a simple web application on socketplane-2 and access it over our vnet on socketplane-1 without having to use the Dockerhost IP or NAT. See blow. First start an image named tutum/hello-world and add it to the foo4 network and expose port 80 at runtime and give it a name “Web”. Use the “web” name with the socketplane info command to get the IP Address. Next, logout and SSH to socketplane-1 and run an image called tutm/curl (simple curl tool) and run a curl <IP-Address> and you should get back a response from the simple “Web” container we just setup. This is great! No more accessing pages based on host addresses and NAT. Although a simple use-case, this shows some of the benefit of running a virtual network across many docker hosts. So i mentioned before that socketplane runs Consul in a separate container, you can see the logs of consul by issuing “sudo socketplane agent logs” on any node. But for some more fun and to poke around at some things we are going to use nsenter. First find the socketplane docker container, then follow the commands to get into the socketplane container. Now your in the socketplane container, we can issue an ip link see that socketplane uses HOST networking to attach consul and get consul running on the host network so the Consul cluster can communicate. We can confirm this by looking at the script used to start the service container. See line:5 of this snippet, docker runs socketplane with host networking. You can issue this command on the socketplane-* hosts or in the socketplane container and you should receive a response back from Consul showing you that is listening on 8500. You can issue “consul members” on the socketplane hosts to see the cluster as well. You can also play around with consul via the python-consul library to see information stored in Consul. Overall this a great upgrade to the docker ecosystem, we have seen other software products like Weave, Flannel, Flocker and others i’m probably missing address a clustered Docker setup with some type of networking overlay or communications proxy to connect multi-hosted containers. Socketplane’s preview is completely opensource and is developed on github, if your interested in walking through the code, working on bugs or possibly suggesting or adding features visit the git page. Overall I like the OVS integration a lot mainly because I am a proponent of the software switch and pushing intelligence to the edge. I’d love to see some optional DPDK integration for performance in the near future as well as more features that enable fire-walling between vnets and others. I’m sure its probably on the horizon and am eagerly looking forward to see what Socketplane.io has for containers in the future. This entry was posted in cloud, containers, Data Center, development, docker, EMC, networking, SDN and tagged containers, CTO, docker, EMC, Open vSwitch, SDN, Socketplane.io on January 16, 2015 by wallnerryan. Over the past few years working at EMC we regularly use NVP/NSX in some of our lab environments and throughout the years this means that we have needed to upgrade, manipulate and overhaul our network architecture with NVP/NSX every so often. We have been using a Python library developed internally by myself and Patrick Mullaney with some help from Erik Smith in the early days, and I wanted to share some of its tooling. Managing, automating, and orchestrating the setup of NVP/NSX components was a must for us. We wanted to be able to spin up and down environments on the flow, and or manage upgrading new components when we wanted to upgrade. Having python bindings for some of the investigative projects we have been working on was out first motivation. A) because we developed and were familiar with Python, B) We have been working with OpenStack and it just made sense. respectively instead of a “data network interface. Service or Gateway nodes need this metadata in it’s configuration JSON to be created correctly. I dont have examples of using this (Sorry) and am focusing on using this for Hypervisor Nodes, since this is what we find we are creating/reconfiguring most. Here is an example of such a config. Once this configuration is complete, you can now reference the “name” of the compute node, and it will provision the COMPUTE node to the NVP/NSX system/cluster. If the hypervisor node is remote the toolkit will use remote sudo SSH, so you will need to enter a user/pass when you get prompted. As you can see, the command runs through all the process needed to setup the node, and at the end of it, you should have a working hypervisor node ready to go. (Scroll down, you can verify it’s setup by looking at the UI) Here is what it looks like when you do it remotely. You’ll then see similar output to the below, running through the sequence of setting up the hypervisor node remotely, keys, OVS calls, and contacting the NVP/NSX cluster to register the node using the PKI. After setup you can verify that the node is setup by logging into it if your remote, and running the ovs-vsctl show command. This will show you all configuration that has been done to setup the hypervisor node. Managers and Controllers are setup and connected, and bridge interfaces created and ready to connect tunnels. We can also verify that the Hypervisor node is setup correctly by looking at the NSX/NVP Manager Dashboard. This shows that the Ubuntu Node is now connected, using the correct Transport Zone, and is up and ready to go. Thats the end of what I wanted to show as far as remote configuration of NVP/NSX components goes. We use this a lot when setting up our OpenStack environments and when we add or remove new Compute nodes that need to talk on the Neutron/Virtual Network. Again there are some tweaks and cleanups I need to address, but hopefully I can have this available on a public repo soon. Now I want to get into using the toolkit’s NVP/NSX Python API. This is a API written in python that addresses the REST API’s exposed from NVP/NSX. The main class of the API takes Service Libraries as arguments, and them calls the init method on them to instantiate their provided functions. For instance “ControlSevices” focuses on control cluster API calls rather than the logical virtual network components. Some example of how to instantiate the library class and use the provided service functions for NVP/NSX are below. This is not a full featured list, and more than less they are for NVP 3.2 and below. We are in the process of making sure it works across the board, so far NVP/NSX APIs have been pretty good at being backward compatible. #print "Available Functions of the API"
# See an existing "Hypervisor Node"
I hope you enjoyed reading through some of this, it’s really gone from a bunch of scripts no one can understand to something halfway useful. There are definitely better ways to do this, and by no means is this a great solution, it just one we had lying around that I still use from time to time. Managing the JSON state/descriptions about the nodes was the hardest part when multiple people start using this. We wound up managing the files with Puppet and also using Puppet for installing base openvswitch software for new NVP/NSX components on Ubuntu servers. Happy Friday, Happy Coding, Happy Halloween! I wanted to update the post with information about the library and how to access it. The great folks at EMC Code ( http://emccode.github.io/ ) have added this project to the #DevHigh5 Program and it is available on their site. Look at the right side and lick the DevHigh5 tag, and look for Nicira NVP/NSX Python under the projects. Information can be seen by hovering over the project. This entry was posted in cloud, Data Center, development, networking, SDN, software and tagged EMC, Nicira, NSX, NVP, Vmware on October 31, 2014 by wallnerryan. I am probably missing a few images here, but you get the point, Object Storage is here to stay. It’s becoming more popular as workloads move to cloud based application architecture where HTTP dominates at scale more than ever. So comes the need to be able to run performance tests on our (pick your favorite) open-source object-storage implementation… or not, if your not into it. It allows you to run tests at scale using “Driver Nodes” and “Controller Nodes”. A Driver Node is the node that does the heavy lifting and generates the load that the test will be producing. A Controller Node collects metrics, orchestrates the jobs and keep track of which tests are running on which Drivers etc. Essentially the M&O/Dashboard. Read more about the specifics in the User Guide on Github (UserGuide). I wont go into detail about how to install in the post, I will just say the guide is pretty straight forward, I ran a multi-driver installation on top of OpenStack IceHouse to test Ceph (S3 and Swift Interfaces on the Rados Gateway) and Amazon S3 Directly. What I will go into a bit is how to define a job, below is an example of how to setup a test for a Rados Gateway Swift endpoint using Ceph. As you can see below, I used a token from OpenStack using the keystoneclient, and an endpoint ending in /swift/v1 in the “Storage” directive of the COSBench XML file. This small test will run a 100% READ test on 240 Objects in 12 different swift containers. This is what the “container=(#,#) and Objects=(#,#) denote. These objects will be in size Ranges of 25MB, meaning 25MB, 75MB, 175MB…etc. After submitting the test you will see output in the Controller dashboard that looks like the below image. To get to this data yourself, click on the the “view details” next to the finished job, then click on “view details” next to the Stage ID of w<#>-s<#>-main with the name “main“. You can then click on the “view timeline status” underneath the General Report to get the below timeline data. A note on the script, if you have a lot of data points the graphs can get junked up with data points being too close, there is a option to specify that you would only like the data points every X number of data points. (e.g it will read every 5th data point) Just pass in a separate argument in the form on an integer to the script at the end. Well, I hope this was interesting for some, and if you have any questions of comments please feel free to comment here or on my github or send me and email. Until next time, cheers. This entry was posted in cloud, Data Center, networking, private cloud, public cloud and tagged amazon s3, ceph, cloud, cosbench, intel, object, storage on September 24, 2014 by wallnerryan.